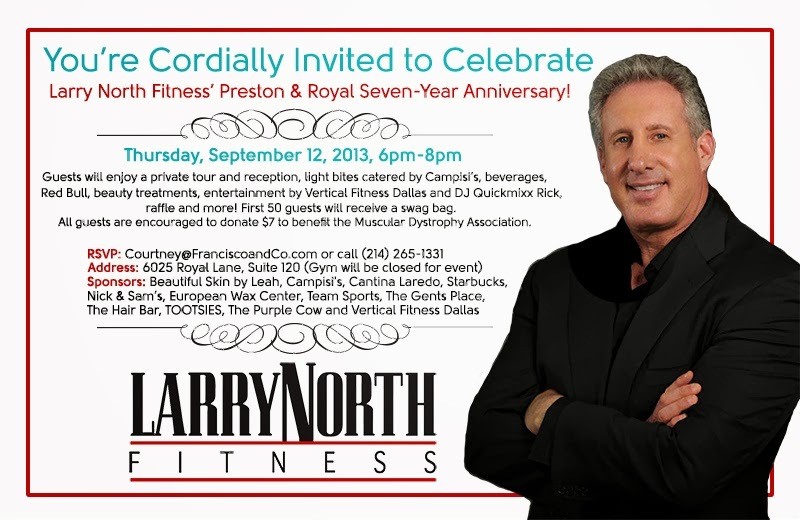 Back in September, Larry North Fitness celebrated its seventh anniversary at Preston & Royal. If you've been following Project Emilie, you know that she does a strict exercise program at Larry North. I knew that she had lots of friends at the gym, but I didn't realize how big of a celebrity Emilie is at Larry North. What's so funny is that she only works out once a week (and that's generous), yet she's had such an impact on all of these people. Trainers, managers, and her fellow gym members LOVE her, and I think it's so cute! Neighbors of the gym joined in to make the evening special, including a team of stylists from The Hair Bar to do hair and makeup touch-ups. Guests were also encouraged to help Larry raise money for the Muscular Dystrophy Association. Whenever swag is involved, Em is there! A day in the life of Emilie: multiple stylists working on her at the same time. Us with Larry North. He's such a nice guy and LOVES Emilie!